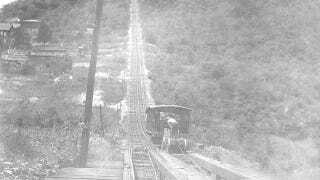 If you're wondering how people first decided plummeting downhill inside a rickety box on wheels seemed like a good time, look no further than the Mauch Chunk Switchback Railway in Pennsylvania. What began as a railway for shooting coal down the mountain turned into a destination for thousands of tourists in the late 19th century. There is earlier precedent of roller coasters for Russia royalty, but it's Mauch Chunk that really popularized the thrill of gravity in America. Not a bad legacy for a railway originally designed to transport coal. Back when the Mauch Chunk Railway first opened in 1827, it seemed like a small technological miracle for coal miners. The 9-mile descent down the mountain took only half an hour, compared to the 4-hour ascent by mule. As curious onlookers came to the Mauch Chunk—only the second in the U.S.—a brave few climbed into the carts themselves. By 1872, however, Mauch Chunk had become obsolete for transporting coal. A tunnel through the mountain sent coal down even faster. But its owners didn't want to tear down the still perfectly functional railway, so they turned it into a tourist attraction. 35,000 visitors a year lined up to shoot down the mountain—for both the thrill of the ride and for the scenic view of the mountains.